Hello! Thanks so much for joining me on my blog tour for my latest Brides of Blueberry Cove book, SNOWFLAKE BAY! And a big thanks to Karen for having me as a guest blogger today! In SNOWFLAKE BAY, heroine Fiona McCrae has a past with our hero, Ben Campbell. He was her older brother’s best friend, so they all grew up together. Ben only had eyes for Fiona’s older sister, Hannah, and though Hannah only ever thought of him as another family member, Fiona’s young heart had belonged to Ben from the start. Of course, to Ben, she was the bratty kid sister. Both Fiona and Ben had left Maine to pursue careers elsewhere, but find themselves reunited back in their hometown where each has returned for family reasons. Have you run into an old flame or old crush and had the chance to rekindle things, or start fresh? Do you have a favorite story of second chances where unrequited love gets a shot at turning out happily ever after? Leave a comment below, and be in the running to win a copy of SNOWFLAKE BAY! “Did you sign the papers? Dot every i, cross every t?” Kerry asked the moment Fiona entered the Rusty Puffin, not pausing as she continued to wipe down the bar. And, actually, her visit to Eula’s was every bit as much the reason for her giddy mood, thanks to the moment she’d had in Eula’s shop with Ben Campbell. Specifically the moment she’d taken off her coat and glanced at him in time to catch that rather pole-axed look on his face. It was quite possible it hadn’t meant that he’d just looked at her as a woman for the very first time, rather than a short, plump annoying kid sister, but she was going to choose to believe that’s exactly what had happened. And she was going to wrap up that moment in a shiny gold bow, and pull it out and open it up every time she needed a little boost. Because that look on his handsome face had made it almost worth—almost—every single moment of adolescent torment he’d put her through. **SPECIAL GIVEAWAY**: Donna has a giveaway for one of her Karen’s Killer Book Bench blog readers! Comment on the following: Have you run into an old flame or old crush and had the chance to rekindle things, or start fresh? Do you have a favorite story of second chances where unrequited love gets a shot at turning out happily ever after? 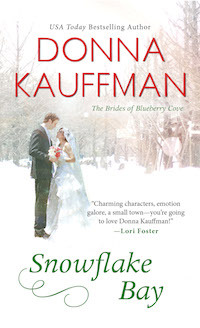 Leave a comment below and be in the running to win a copy of SNOWFLAKE BAY by Donna Kauffman. Don’t miss the chance to read this book! Thanks, Donna, for sharing your story with us! Good morning, Donna, and welcome to Karen’s Killer Book Bench! I’m thrilled you could be with us today to tell us about your new release. I had my first taste of your writing when you were with the original Loveswept publisher. I still have several on my Keeper Shelf. My favorite is Bounty Hunter. 🙂 It was that book that made me wonder for the first time whether I wanted to explore my own suspense leanings. Cannot wait to read your new book! Karen, thank you for this lovely introduction to Donna Kauffman. Your story line does resonate with me but in a different way. I have met “old flames”, one unrequited by hi and the other I had turned down, due to our youth. When reunited, I found I was soooo glad, that even in my youthful naiveté, I turned down the one and the other had no desire to go further, because neither grew into the men who would have been worth my spending my life with. Thanks again for the interview. You can bet I’ll be looking for this book. You’re welcome, Kathleen! Happy Reading! Hi Karen, Thanks so much for having me! It’s a pleasure to be here. Wow, you really have been a fan for the duration. I love it! Bounty Hunter was a fun one. I’m thrilled that Bantam has released all of my Loveswepts as e-books. It’s been fun to hear from readers who are just now discovering them! Actually, I’m going to have to replace a number of the books I have because my eyesight is not what it used to be. If I want to reread them, I’ll need them on my Kindle. 🙂 I can definitely recommend your books to my readers! No second chance stories here, but I do enjoy reading them. I met my husband when we were teenagers, so I don’t really have any old flames to run into. That’s fine by me. I do like to read about couples who get another chance at happiness, though. It is very sweet. I’m happy to say that I didn’t kiss a lot of frogs before I met my Prince. We just celebrated our 37th wedding anniversary the end of September and he’s truly my better half. Thanks to Donna and Karen’s Killer Book Bench for the giveaway! Every time I go home I see my first boyfriend. I still feel a spark when I see him but nothing has happened since high school! I did run into an old boyfriend – plus I had my new husband with me, too! I wondered what I ever saw in him!!! And I have my wonderful Hubs!!! Love Donna’s books! !